Today’s guest post is by Mike Figliuolo, the author of One Piece of Paper: The Simple Approach to Powerful, Personal Leadership, and a leadership expert I admire greatly. Your team doesn’t trust you. Honestly. They don’t. Trust is key to effective working relationships; yet, as you climb the corporate ladder, trust seems harder to earn and easier to lose. What causes a team to not trust their leader? You. Yes, you. You’re unpredictable and your team doesn’t know what to expect from you. But, these are fixable problems. Trust is about an ability to rely upon or expect a predictable outcome. When you act in ways your team doesn’t expect, it erodes trust and makes them wonder what you’re going to do next. If you can clearly lay out how your people can expect you to behave in a variety of situations, they’ll have a basic expectation upon which to build a foundation of trust. These expectations have to be personal and meaningful enough to you that they guide your behavior. I refer to these guiding principles as “leadership maxims” which are rules of behavior or conduct. The collection of all your leadership maxims becomes your personal leadership philosophy. I encourage you as a leader to define your own set of leadership maxims. They can be as simple as one of mine which is “What would Nana say?” For reference, Nana was my grandmother. I can use that maxim to guide my behavior. When faced with difficult choices, I simply ask “what would Nana say?” and my choice becomes clear. When I explain this maxim to my team, they’ll better understand how I make choices and they’ll see my behavior as consistent with this maxim. It is this consistency that forms the basis of trust. Be yourself. When you write your leadership philosophy, spare your team the corporate-speak and tell your personal story instead. They can spot a phony a mile away. Give in to emotion. Articulate your leadership philosophy as a set of reminders of stories that have deep emotional meaning for you. The reminders are touchstones to guide your behavior. The stronger the emotions associated with the story, the more likely you are to change your behavior to be consistent with the lesson the story reminds you of. Lead yourself. You have to know where you personally want to go in life and define your personal code of conduct before you can lead someone else. Write down reminders of your code as part of your philosophy. Lead the thinking. Your job is to set direction, challenge outdated thinking, and define standards. Create reminders that force you to do these things on a regular basis – not only during the annual strategic planning process. Lead your people. Get dirty. Know their jobs. Know them as individuals – not as a box on an org chart or a job title. When they know you care about them as a person, they’re much more willing to give you everything they’ve got. Lead a balanced life. If you’re burned out, you’re worthless. Set your boundaries and stick to them. Let everyone else know what they are. Balance applies to your work too – have enough work you love to do to balance out all the mindless tasks you don’t enjoy. Again – create some simple yet personal guidelines that remind you make decisions that keep you in balance. Pull it all together. Document all your reminders of how you want to behave on a single piece of paper. Tack it up on your wall or carry it on a card in your wallet. Having that simple reminder of your approach to leadership always within arm’s reach will help you live up to that standard every day. Share. Tell people your personal story. Share your triumphs and failures. Help them understand the experiences that have made you who you are as a leader. When you share, you help them understand you better. That understanding and the vulnerability you demonstrate while sharing builds trust between you and your team members. The sooner you commit your leadership philosophy to paper, the better off you are. Be sure it is personal, authentic, and free of jargon or buzzwords. Share it with your team. Live it every day. Help them see you’re really not that complex or unpredictable. Morale, productivity, and trust will all increase as a result. – Mike Figliuolo is the author of One Piece of Paper: The Simple Approach to Powerful, Personal Leadership. He’s the managing director of thoughtLEADERS, LLC– a leadership development firm. An Honor Graduate from West Point, he served in the U.S. Army as a combat arms officer. Before founding his own company, he was an assistant professor at Duke University, a consultant at McKinsey & Co., and an executive at Capital One and Scotts Miracle-Gro. 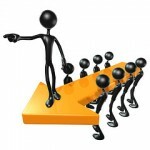 He regularly writes about leadership on the thoughtLEADERS Blog.